To celebrate the coming Chinese New Year, Macao Post will issue a lucky ornament titled “Macao’s Lunar Year of the Monkey Stamp” on 22nd January 2016. 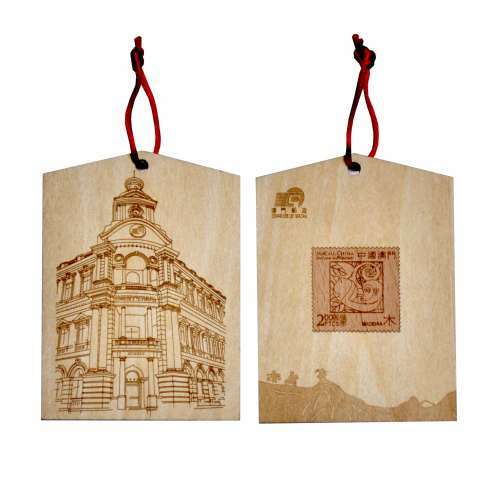 It is engraved with laser techniques for highlighting the Macao Post Headquarters’ building and a thin wooden card with the wood monkey stamp image is affixed on the other side. The unique design is certainly a precious and commemorative collectable. It will be available for sale at the Macao Post Headquarters, the “Rua do Campo” Post Office, the Maritime Ferry Terminal Post Office, the Airport Post Office and the Communications Museum and the selling price is MOP 15.00.